Converts standard walker into wheeled walker . Provides forward mobility with no lateral movement . The large 5" wheels are ideal for navigating difficult terrain such as pavement, grass or carpe. For 603650A - Weight capacity of 300lbs . Now available with eight adjustment holes to accommodate a broader range of user heights . 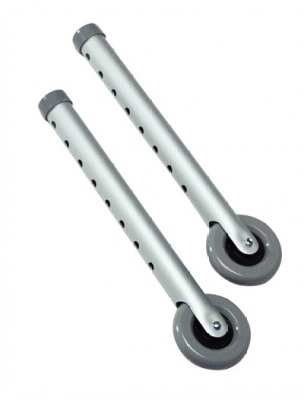 Fixed wheels attach to the front of walkers only and are recommended for use with Lumex glide brakes . Comes complete with glide covers . Designed to meet the requirements of HCPCS code: E0155 . Limited lifetime warranty. Kits of Glide Brakes and 3" or 5" fixed wheels also available . Kits of 3" or 5" fixed wheels and AutoStop Wheels or Glide Brakes also available . Designed to fit 1" standard walker tubing . Wheels are recommended for use on Lumex Walkers (we cannot guarantee the performance of these wheels on other industry walkers).